For those of us privileged with credit cards, bank accounts and online bill paying, it can be easy to take financial inclusion for granted. But for Elsa Maria Correa Correa—unlike the 54 percent of Ecuadorians that are unbanked today— financial inclusion was nothing short of life-changing. She and a small group of hardworking entrepreneurs formed a FINCA Village Bank in Guayaquil, Ecuador 11 years ago. Like over 300,000 low-income people in Guayaquil, Elsa Maria, a 44-year old unmarried seamstress, lived in a tiny, leaky house made of bamboo. The long dirt road that leads to her house would turn to thick mud with the torrential downpours of Ecuador’s rainy season. 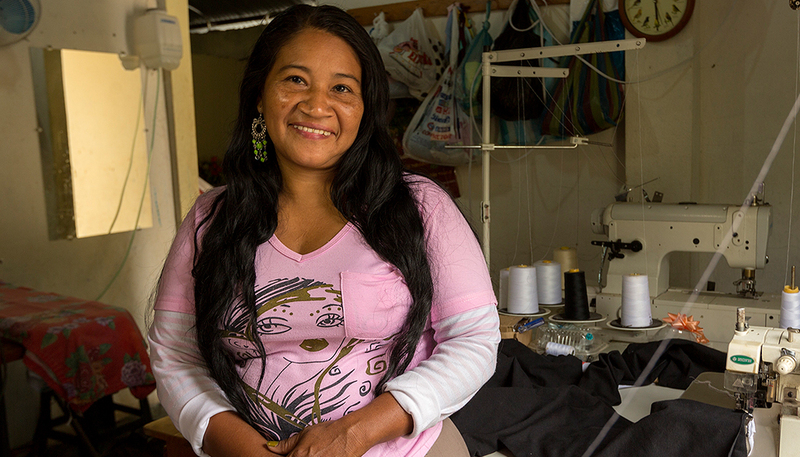 Yearning for a better life, and motivated by the idea of creating a sewing business, Elsa Maria got together with her fellow microentrepreneurs and a FINCA loan officer in her community to create their Village Bank. She invested her first loan of $200 in fabric and other materials necessary to make clothing. She first started selling the items she made to her neighbors. However, through hard work, dedication, and responsibility, Elsa Maria expanded her flourishing business by acquiring more sewing machines, hiring several seamstresses and adding more families to her clientele. Then, she sold her flimsy bamboo house and used her savings from the business to buy a piece of land and built a solid cement home. Today, Elsa Maria is one of over 27,000 FINCA Ecuador clients. She currently has a FINCA loan of $2,000, with which she has purchased her fifth sewing machine, started a small store and even set up a workshop for the seamstresses she employs. Thanks to FINCA I have my house and my business. I am grateful to FINCA because it trusts in the people.